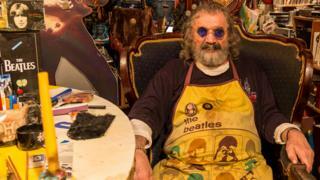 A Russian whose love of the Beatles led him to turn his flat into a "Fab Four" museum has died in St Petersburg. Russians knew Kolya Vasin as the Beatles' biggest fan during Soviet times, when the communist authorities saw western rock music as subversive. Vasin, who died aged 73, began collecting Beatles albums and memorabilia in the 1960s. He treasured a record - Live Peace in Toronto 1969 - signed by John Lennon and Yoko Ono. On Facebook one of Vasin's friends, Nick Barabanov, wrote that Nikolai (Kolya) Vasin had "gone to join John Lennon and George Harrison. May they have a happy and bright time there!" For more than 50 years the Beatles dominated Vasin's life. He dreamed of dedicating a "shrine of love" in St Petersburg to John Lennon but the project was never realised, even though city officials found a suitable site for it. Many fans supported the shrine idea. A leading Russian cultural commentator, Artemy Troitsky, says the impact of the Beatles songs behind the Iron Curtain was profound. "The Beatles turned tens of millions of Soviet youngsters to another religion," he told the BBC. Alexander Kan, a BBC Russian Service analyst, wrote in a tribute that Vasin was legendary among Russian rock fans. He met Vasin in 1980, by which time Kan himself was enthusiastic about other bands besides the Beatles, "but for him there was nothing more important". Vasin described as divine intervention the fact that John Lennon had sent him the signed album. In 1970 he had sent a birthday greetings telegram to Lennon and miraculously the Beatles legend had picked it out of his pile of fan mail from around the world. Vasin influenced many other Russians with his passion for the Beatles and wrote a book about the band's cultural impact behind the Iron Curtain. The book's title - Rock on the Russian Bones - referred to Soviet fans' use of old X-ray plates for inscribing bootleg recordings of Beatles tracks. Western rock albums were nearly all banned by the authorities but there was a vast black market of bootleg recordings among youngsters in the Soviet bloc. Once communist-era censorship had disappeared Vasin staged parties every year to mark the birthdays of each of the Beatles.